Thank you everyone for your continued prayers for my family. God has truly been faithful! Praise – Our son-in-law Karl has a job that is just two miles from where they live! It’s at a Love’s Truck Stop (also has a Mc’D, Subway, and mini mart etc.). The manager is excited that Karl is working on a Business Management degree. He hired Karl with hopes that Karl will become an assistant manager within a year and continue to grow within the company. Praise – My husband, Jim, beginning June will become the Assistant Director of Education at the Christian school he is teaching. He will shadow the Director of Education this coming year then the following year he will step into that position. So this coming year he will be “Principal” of the Elementary along with other administrative duties the Headmaster requires of him. The following year he will be over the whole school, Elementary, Middle School and High School. My dear husband took the position without knowing if his pay will increase. Either way he will make much less than public education administration. But we are praying that it will be an increase considering his current pay is considered poverty level. Either way, Jim has been in such peace this past year. We truly believe that Jim is where God wants him to be. Praise – With Jim’s new position the school will be sending him to their sister school for their first graduation in November. He will be there for 10 days and will provide some teacher training while he is there. The school will pay for his air fare and accommodations, but he will need funds to pay for passport, visas, shots, medicines and other necessities. Praise – The lupus and Rheumatoid Arthritis tests came back and my lupus ANA is mildly elevated – meaning I am still in remission! My RA test showed mildly elevated which means I am now in remission! Praise he Lord. I still have my other chronic illnesses, but these two life threatening illnesses are in remission! So thank you for your much needed prayers. I am still having some health issues, but I know that God will heal these too. God is so good…. All the time! Praise God for these blessings. I continue to pray for your family, I love you sis. I am praising and rejoicing with all of you! Praise be to God! Thank you for your WFW! I'm thankful to read of your blessings, thank you for sharing them. I'm remembering your family this week on the anniversary of Chris leaving his earthly life. Hugs to you. There's much to praise about. 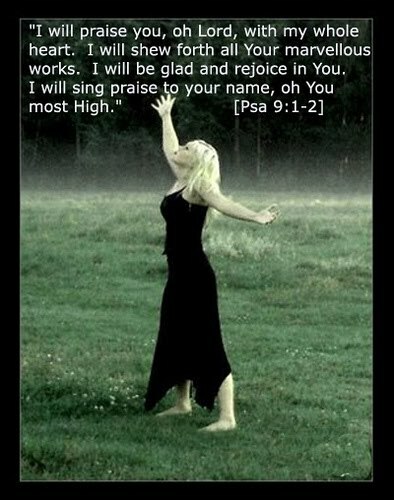 Praise the Lord for your praises! i'm rejoicing with you, michelle. God is good! God is good indeed and He loves our praises.....Praise Him for His healing powers.. I too am being both blessed and challenged....He is good. Love the picture! Love praise reports! Glory hallelujah to Jesus!